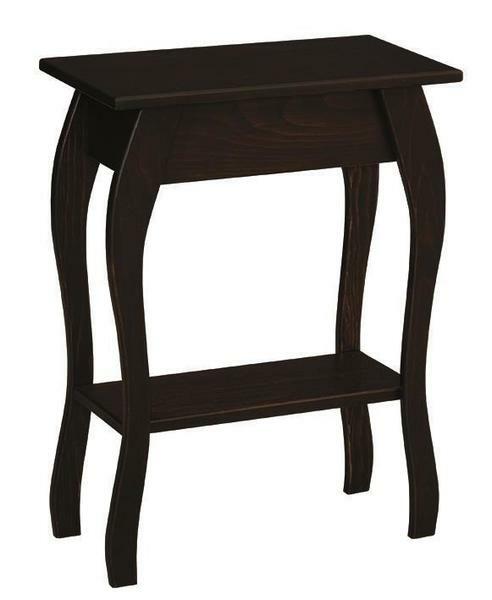 The curves of the Amish Pine Wood French Country End Table make it a delight for the living room or family room. This fine pine table is sweet yet strong, offering a lower shelf in addition to its rectangular table top. Frame the sofa or loveseat with accent tables that enhance the look of your living room as they function to offer up tabletop space. This collection of pine furniture is built by hand in Pennsylvania. Other fine pine selections from the Heritage Pine Collection include pie safes, hutches and cabinets. The finish options are exciting, since solid pine takes to paint and distressing easily. Choose from a variety of colors or create a vintage look with distressing options. If you have any questions, we're just an email or call away. Thank you for shopping with us!